A small and convenient sized bag of the Gambler tobacco you already love. Perfect for mixing or trying out a new blend. 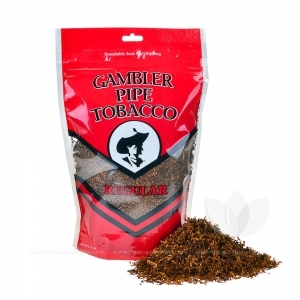 Gambler Regular Pipe Tobacco is a robust and full-bodied blend with a strong and jarring taste. This is the perfect flavor and cut for any experienced pipe smoker, but can be a bit overwhelming for a newbie. With a relatively small selection of flavors and package sizes, Gambler Pipe Tobacco focuses on delivering the blends everyone has grown to love over the years. 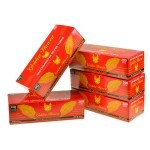 Each reseal able bag is packed full of the highest quality tobacco available. 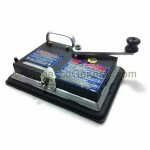 Gambler Pipe Tobacco is one of the oldest and most respected tobacco brands on the market today. Manfuacturing everything from Pipe Tobacco to rolling machines and Filter Tubes, they are well regarded as the one-stop shop in tobacco. Legendary quality and decades of combined experience is what you can expect with every ounce of pipe tobacco you buy.